National program teaches patients with chronic obstructive pulmonary disease how to manage symptoms and avoid repeated visits to the hospital. At age 69, Chris Burden is still working 60-hour weeks as a bailiff and process server, a job that takes him all over New Brunswick and has given rise to his self-styled moniker of "road runner." It's a name he might have been forced to give up were it not for INSPIRED, a national program that helps people with chronic obstructive pulmonary disease, or COPD, to better manage their symptoms and avoid repeated admissions to hospital. COPD is an incurable, progressive lung disease, most often caused by smoking, that affects an estimated 800,000 Canadians and is the country's fourth leading cause of death. Burden, who never smoked, was diagnosed with COPD about five years ago, after he began experiencing severe breathlessness with the least bit of exertion. That meant having to stop a couple of times while making his way from the bed to the bathroom in the morning and having to sit down to catch his breath once he got there. Rest breaks were required after each of his "morning duties": taking his blood pressure pills; brushing his teeth; and shaving. "And then the torture was just getting into the shower," he said from Fredericton, where he lives with his wife, also a non-smoker. "This process would take me about an hour." But thanks to the INSPIRED program — or "COPD school," as he calls it — Burden has been able to keep his symptoms under control with a combination of medications, diet and breath-easing exercises. "They taught us everything about COPD, what to do if you're feeling bad, what to eat," he said. "I haven't been back to hospital since last March." Kathy Kowalski, regional director of electrodiagnostics and respiratory therapy at the Horizon Health Network in New Brunswick, said COPD can be severely disabling. Those afflicted can experience frightening episodes in which even modest physical exertion leaves them gasping for breath. 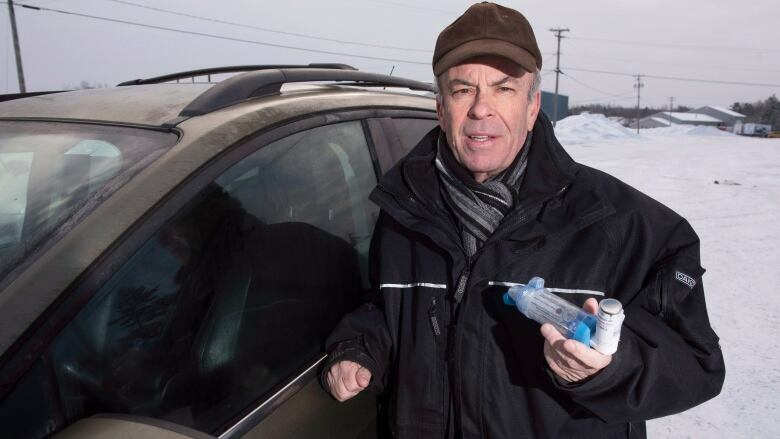 The condition — which besides smoking can be caused by environmental or workplace exposures to pollutants, as well as by a rare genetic disorder — presents as either chronic bronchitis or emphysema, which becomes progressively more debilitating over time, Kowalski said from Fredericton. "So things like being able to mow your lawn or shovel your walkway ... Last year, you may have been able to shovel your complete walkway, and now you have to take three breaks before you complete it," she said. "People often think of it as part of the aging process or because they're out of shape, and really it is the disease itself that is progressing." Supporting patients as their COPD worsens is the goal of INSPIRED, which was co-founded in Halifax eight years ago by respirologist Dr. Graeme Rocker and then expanded to 19 sites across the country with funding from the Canadian Foundation for Healthcare Improvement, or CFHI. "The program is really about transforming care for people with advanced COPD and it's working with them so that we can meet their needs and support them in their homes and communities, and keep them out of the hospital, where they don't want to be," Maria Judd, CFHI's vice-president of programs, said from Ottawa. "This is a program that doesn't cost a lot of money and has great results," she said, noting that an independent analysis found that for every dollar spent on the home-and-community approach to care, there's a $21 saving in hospital-based costs. Judd said that among the roughly 2,000 patients enrolled in the expanded program since 2014-15, there's been a 52 per cent drop in emergency department visits and a 64 per cent reduction in hospital readmissions overall. Now INSPIRED is being broadened again, with six of the 19 teams adding another 39 new sites in their regions, with the goal of signing up an additional 2,300 patients in the next 18 months. By 2021, CFHI hopes to see 5,800 Canadians with COPD benefiting from the outreach program. Kowalski of New Brunswick's Horizon Health, one of the six sites extending their programs, said the network has seen a 69 per cent decrease in hospital readmissions among enrolled COPD patients since INSPIRED was implemented. The other sites are Alberta Health Services (Edmonton zone); Health PEI; Ontario's Joseph Brant Hospital; the Nova Scotia Health Authority; and Winnipeg Regional Health Authority. As one of the patients Horizon Health's program has helped, Burden is grateful he isn't being forced to retire because of his disease. "I'm not prepared to sit home every day on the couch and feel sorry for myself," he said. "I've got things to do."